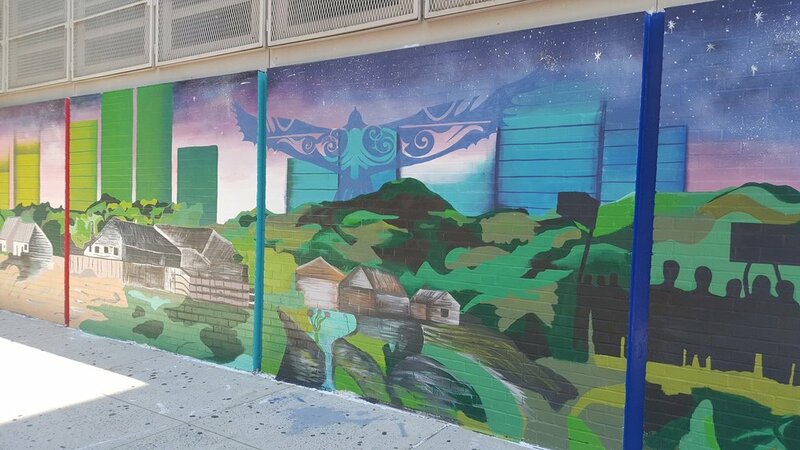 "Cosmic Wings of Change" on Brandeis Highschool on 84th and Colombus Ave, designed and painted in collaboration with 22 youth apprentices and teaching artist Frank Praga for Creative Artworks. A visual representation of the relationship between time, nature, and the human experience. As time flows forward and we grow and evolve, are born and die, reborn and metamorphosized, we have always been and always will be one and the same. As a tribal species we are conscious of our differences and in perpetual pursuit of an individual identity to differentiate "us" from "the other", but we are but bottled stardust ladled from the same cosmic spring. We sweat the same rain that the clouds cry into the rivers that seek the ocean, rise from and return to the same dirt that sprouts the trees that photosynthesize the air that fills our lungs with life. We are all connected: through love, through time, through music, through our shared history and our collective future. In Lak'ech Ala K'in: I am you and you are me, if I hurt you I hurt myself.